On 10 May 1988, a disastrous fire in the church of St Mary at Hill in the City of London destroyed most of the roof of the building as well as much of the interior and parts of the organ. 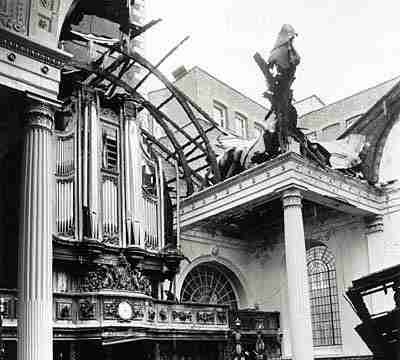 The picture below gives a good impression of the damage to both the building and the organ. 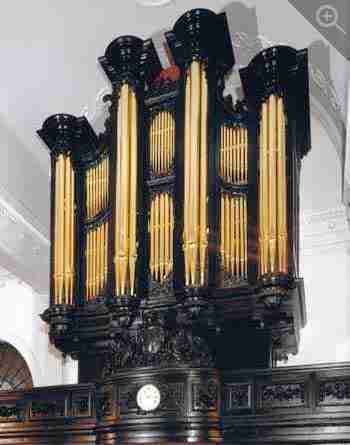 The 1848 William Hill organ of St Mary at Hill is of special significance in the history of organ-building in Britain. It was noted particularly for its use of the "German System" in having a key compass which started at C together with a full pedal board and a case design which was strongly reminiscent of the wonderful Father Smith four tower cases. The loss of the organ was mourned by many. After some initial restoration work by another company, funds became exhausted and the organ languished in storage for ten years with little work being undertaken. But, in 1999, the prospect of Heritage Lottery Funding became a reality and it was possible to commence a full restoration in 2000. William Hill's instrument originally had only two manuals. Thomas Hill worked on the organ in 1879-1880 and added a third manual, a Choir Organ which was placed on the gallery outside the confines of the case. His work was however sympathetic to the original material in other respects. The only other significant work undertaken on the organ was by Hill Norman and Beard in 1971. Almost all the original pipework was preserved, as were the soundboards, most of the drawstop action and some of the key action. 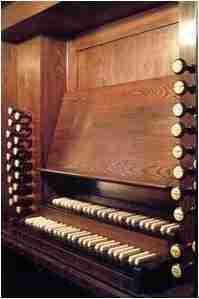 However, the Choir Organ was "updated" to a more neo-classical design, and attempts were made to lighten the notoriously heavy key action using aluminium pallets and other action parts. At the same time, the bellows was put out of action and "schwimmers" were incorporated into the bottoms of the soundboards. It was decided after some considerable discussion that the organ should be restored closely to its original two manual scheme. Initial hopes that the original soundboards might be restored were dashed when it was discovered that some were missing altogether and others had been so badly damaged through investigations which were to have enabled copies to be made, that restoration was not an option. Large sections had been cut away and lost. However, sufficient material remained, including almost all the upperboards, to enable a fairly faithful reconstruction which was carried out strictly along traditional lines. The tables, slides and bearers together with all the usual soundboard components are of solid timber and no form of slider seal is employed. However, bearing in mind the myriad of complaints of the heavy action over almost all the life of the organ, it was decided to make some small changes to the pallet sizes, although all other details of the pallet and soundboard design were carried out strictly to other contemporary instruments. The rollerboards, which probably date from Thomas Hill's work, were restored and new trackers of old design were made to replace the aluminium trackers of the 1971 work. When the first aborted restoration work was started, it had been decided that the original front pipes should be replaced with new. The existing pipes were sawn off above the mouths, the upper portions being discarded and the lower portions kept as a pattern for new pipes. We decided we would attempt to restore what remained with new sections replacing the material which had been lost. In addition, there were a number of interior pipes which had been completely destroyed. New material was required for this but analyses of the existing material revealed that all the pipework was made of a material which was almost 96 per cent lead. We resolved to re-create this mix which, after some trial and experiment, we managed to do, the casting of metal of high lead content being notoriously difficult. A new casting gauge was made with special heat-resisting material, and a number of modifications were made to the casting bench as well as the casting technique. "Impurities" were added to the mix to render the material more stable than a pure tin-lead metal would be, and we managed to get very close to the mass spectrometry analysis we had had done for us.